Harmony River Chorus is a membership organization of female singers, who meet regularly to practice, perform, socialize, and have fun. We currently have singers of all ages, all walks of life, and from all parts of the Central Savannah River Area (Augusta, GA, North Augusta, SC and Aiken, SC, just to name a few). The main purpose of Harmony River Chorus is to get out and sing for our community, create life long friendships and fun fellowship. 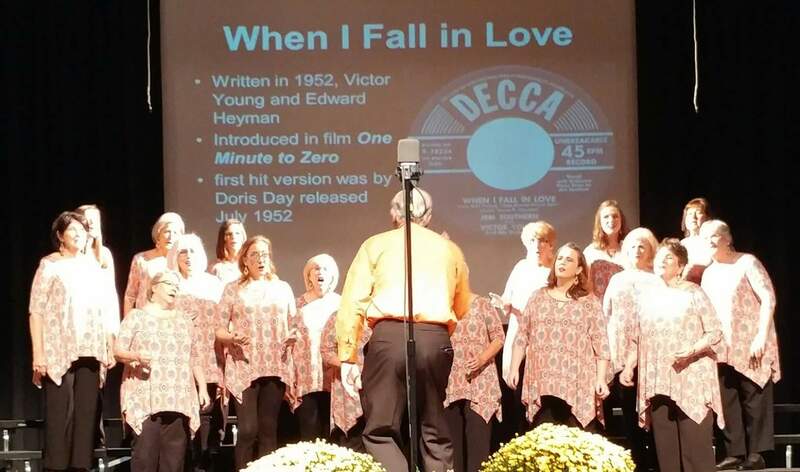 We sing at annual shows, a number of community events, and at an annual competitions. We also have Quartets that perform for special occasions. If you're looking for a unique musical experience to liven up your next function or event, please check out our Hire Us section. In addition to sharing our music with others, another great passion of ours is learning more about the art of four-part acappella harmony. Vocal instruction is a regular part of chorus rehearsals, and a very important component of the chorus experience. A couple of times a year, we get coaching from a visiting master in the art of barbershop, where we learn many fabulous tricks of the trade and have a great deal of fun! CompetitionIn the spring of every year, Harmony River Chorus participates in annual Contest with other choruses in Region 14 . Competitions are a special time for quartets and choruses from our region to come together to sing for each other, and get some constructive feedback from a panel of judges. The winners of the regional competition in both quartet and chorus categories get to travel to International Competition, which is held in the fall in a city selected each year. Click here to learn more. We also support music education for young women in our community by providing $500 scholarships to women pursuing a degree in music education or performance. A number of members form their own vocal quartets in addition to singing with the chorus. Harmony River Chorus currently is home to a few wonderful quartets, and we are very proud of them! Please contact us if you want to find out more information about our Quartets. Harmony River Chorus is a chapter of Sweet Adelines, International, a non-profit organization of approximately 30,000 members in choruses and quartets, worldwide. The Headquarters is in Tulsa, Oklahoma.